OKLAHOMA CITY (March 7, 2017) –Oklahoma’s American Indian students continue to lead the nation in math and reading scores. The 2015 National Indian Education Study (NIES) released today shows significant gains in reading for Oklahoma fourth-graders, who scored 19 points above the national average. Oklahoma’s American Indian scores in fourth- and eighth-grade math and reading have consistently been above the national average since the test was first administered in 2005. “We are immensely proud of our American Indian students and their achievements on the Nation’s Report Card,” said State Superintendent of Public Instruction Joy Hofmeister. 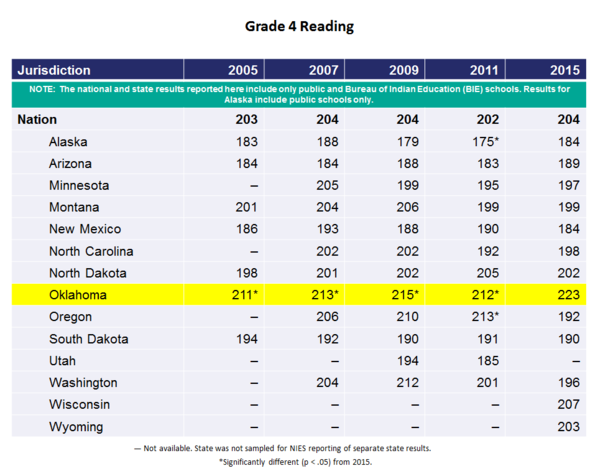 In fourth-grade reading, Oklahoma’s scores increased 11 points, from 212 in 2011 to 223 in 2015. The national average is 204. Of the 14 states sampled, Wisconsin was closest to Oklahoma at 207 points. In math, Oklahoma fourth-grade scores increased one point, from 234 in 2011 to 235 in 2015. Again, Oklahoma performed above the national average of 227. 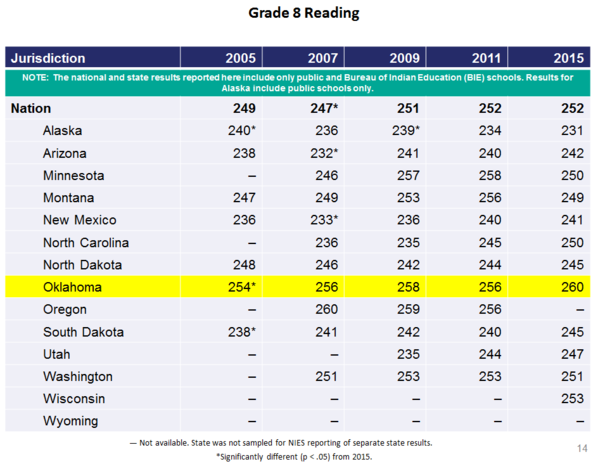 In eighth-grade reading, Oklahoma gained four points, up from 256 in 2011 to 260 in 2015, above the national average of 252. Eighth-grade math is the only area in which Oklahoma’s American Indian test scores dropped. The state scored 272 in 2011 but was down three points to 269 in 2015. However, this is still above the national average of 266. “There are more than 170 American Indian school administrators and over 3,500 American Indian teachers in Oklahoma schools,“ said Hofmeister. “By working together, we can continue to raise the achievement level for all American Indian students. “In Oklahoma, we understand the importance of early childhood development. Several tribes are developing early reading programs that incorporate their native languages. This will not only continue to help drive up reading scores in the future, it will pass on vibrant languages to the next generation of tribal leaders and community members. NIES is conducted through the National Assessment of Educational Progress (NAEP) and provides information on the academic performance of fourth and eighth-grade American Indian/Alaska Native (AI/AN) students in reading and math. 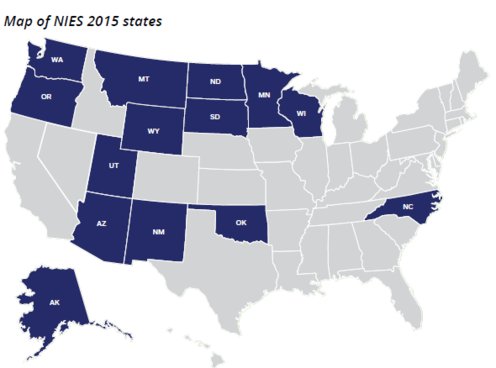 From 2005 to 2011, NIES results were reported every two years. After 2011, the NIES reporting cycle was changed to every four years. Students were identified as AI/AN based on school records and were sampled along with other students participating in the NAEP 2015 subject-area assessments. Nationally, 16,700 American Indian/Alaska Native students from fourteen states participated. Of those, 1,500 were from Oklahoma.